This book addresses the use of Benedict Spinoza’s philosophy in current attempts to elaborate an ecological basis for international environmental law. Because the question of environmental protection has not been satisfactory resolved, the legal debate concerning our responsibility for the environment has – as evidenced in the recent UN report series Harmony with Nature – come to invite calls for a new eco-centric, rather than anthropocentric, legal paradigm. In this respect, Spinoza appears as a key figure. He is one of the few philosophers in the history of western philosophy who cares, and writes extensively, about the roots of anthropocentrism; the core issue of contemporary normative debates in ecology. And in response to the rapidly developing ecological crisis, his work has become central to a re-thinking of the human relationship with nature. Addressing the contention that Spinoza’s ethics might provide a useful source for developing a new, eco-centred framework for environmental law, this book elaborates a more nuanced understanding of Spinoza’s philosophy. Spinoza cannot, it is argued here, simply be reduced to an eco-ethicist. That is: his metaphysics cannot be used as basis of an essentially naturalised or extended human　morality. 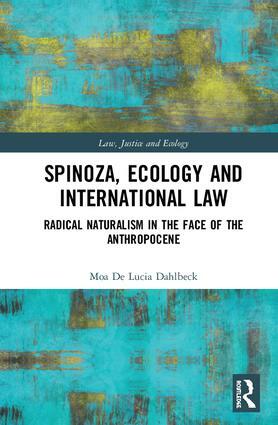 At the same time, however, this book argues that the radicality of Spinoza’s naturalism nevertheless offers the possibility of developing a more adequate ecological basis for environmental law. Moa De Lucia Dahlbeck is a postdoctoral research fellow at the department of Law at Gothenburg University and a member of the Spinoza Research Group (Grupo de Investigación sobre Spinoza y el spinozismo) at the Faculty of Philosophy and Arts, Buenos Aires University.